The master bedroom in the new house was not in bad shape when we bought it. It was just beige. VERY beige. The walls and carpet were beige. 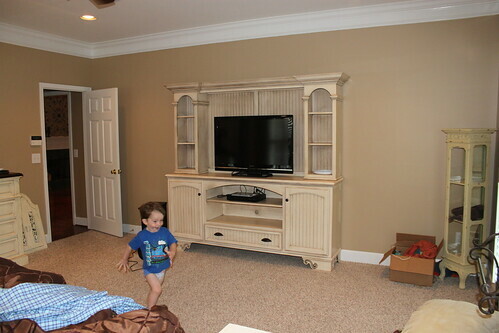 And with our beige-ish furniture, it just looked really blah and washed out. See? I really wanted to recreate the way that the dark green wall color from our old house made the furniture POP! So off to Sherwin Williams I went to buy some paint samples. I knew I wanted to incorporate some of the blue-green color from the scarf on the bed and the wall plaque leaning against the nightstand. 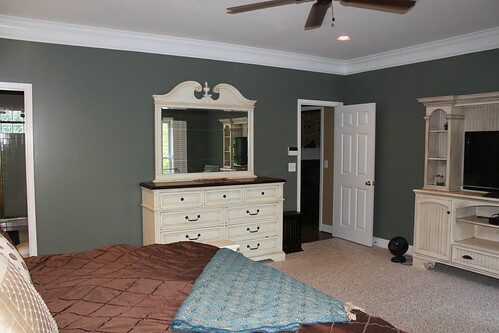 It never ceases to amaze me how different paint colors can be in different rooms with different lighting. 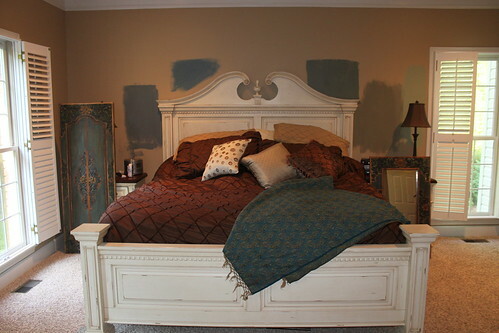 It’s CRAZY how different some of these paints looked in this bedroom than other rooms I’ve used them in the past. SW RETREAT! It’s the perfect green/gray/blue blend I was going for in this room. Very cozy, and it makes the furniture really POP! We still have some finishing touches to put on the room, but I had to show off the end results of the painting progress. I am SO happy with it. It really is a retreat now! It looks so good! Beautiful room and house! It’s so gorgeous. That wall color is just what your bedroom needed. And those shutters are so fun! Your bedroom is beautiful! 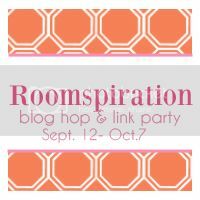 So glad you linked up to Roomspiration! 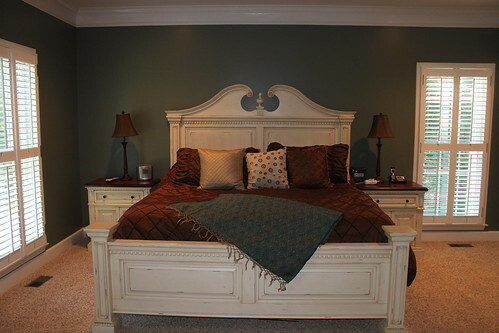 Where did you purchase your bedroom furniture?